Lester signing books at the party. Lester Brown’s memoir Breaking New Ground: A Personal History (W.W. Norton & Company) hit the bookshelves yesterday. Last Friday we held a book release party with family, friends, colleagues, and other environmental leaders. While we munched great food and drinks, Lester regaled us with stories about growing up on a farm in southern New Jersey and starting a tomato business with his brother Carl. He also answered questions about his time in India and what the future might hold. It was a great night to celebrate and reflect on Lester’s remarkable life and career as an environmental leader. In Breaking New Ground Lester recounts his life story as a founder of the global environmental movement. He recognized the process of globalization well before the term existed and helped define sustainable development. In his book, he reveals what inspired him—and the millions who have read his books—to become environmentally active. 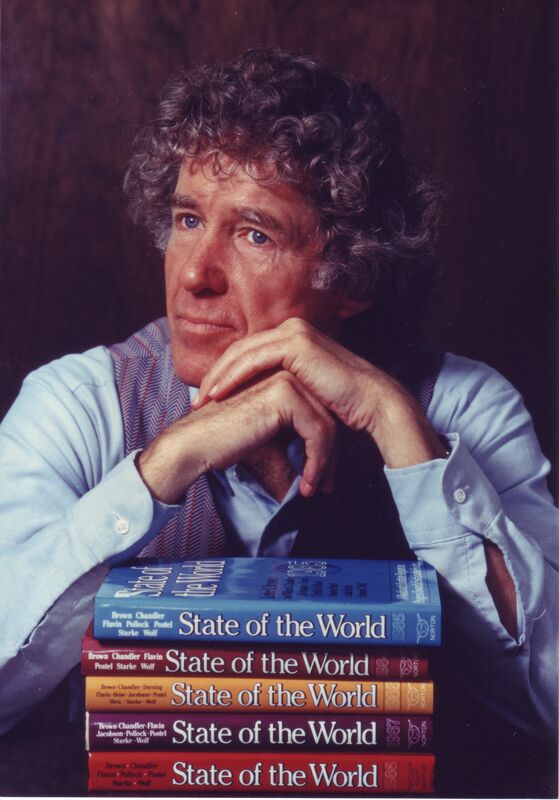 Lester with copies of State of the World. While on a brief assignment for the USDA in India in 1965, he pieced together the early clues of an impending famine. His urgent warning to the U.S. and Indian governments set in motion the largest food rescue effort in history, saving millions of lives. This near miss by India led it to adopt new agricultural policies that he helped to shape. Lester went on to advise governments internationally and to found the Worldwatch and Earth Policy institutes, two major non-profit environmental research organizations. Through these organizations and his writings, including 51 books published in 42 languages, Lester has helped us understand the interconnections among such issues as overpopulation, water shortages, and climate change, and their effect on food security. His 1995 book Who Will Feed China? led to a broad restructuring of China’s agricultural policy. Never one to focus only on the problem, he always proposes pragmatic solutions to stave off the unfolding ecological crises that endanger our future. At the Earth Policy Institute, Lester has been offering responses to the major environmental challenges facing us today. Lester on the family farm at age 5. From a poor, but ambitious young man to a scholar and leader, Lester Brown inspires people to get to know the world around them. Breaking New Ground is all the more engaging because of his drive to make the world a better place. "This is the life story of a true American hero . . . as a scientist and public intellectual dedicated to the cause of sustainability Lester Brown is in a class by himself." —David W. Orr, Paul Sears Distinguished Professor, Oberlin College. Buy your copy today! And, check out photo albums, videos, kudos, and Chapter 1 up now on our website. It is always terrific to learn about how someone is promoting Plan B. Well, today we received the best news ever. Rather than summarize it, I am reprinting the email in its entirety. We recall perfectly well that during one of your visits to the Netherlands you mentioned that for every nation in the world it takes vision and courage to take the necessary steps to contribute to the directions you carried out in your praise for Plan B. ….. and we did! We are pleased to share with you that in our country the Netherlands more than 40 organizations (employer and employee organizations, financial institutions, NGO and our Government) reached an agreement on a ‘Dutch Energy Agreement for Sustainable Growth’ to mobilize our nation to implement concrete actions in terms of energy savings, CO2 reduction, scaling renewable energy and mobility & transportation in 2020. Your limitless efforts to share with the world your deep intrinsic belief that we need to act now, inspired many of us to transform it in The Netherlands into reality. Should you be interested to have more background information, please let us know at any time. Yes, it can be done. Governments and corporations can work together for the people and the earth.